Pets – don’t ya just love ’em? It seems as if everyone I know has an incredibly talented, hard-working and highly intelligent cat, dog or iguana that makes their otherwise dull and dreary lives somehow bright and meaningful. They rarely miss an opportunity to remind me that I, too, could have a bright and meaningful life if I had a pet instead of two drooping house plants and a big rubber rat. They persist despite the fact that I frequently remind them my last pet – a surly 100-pound Doberman named Drago – made my life ever so exciting by attacking parked cars, stealing neighbors’ barbecue entrees and barking at hallucinations around 3 o’clock every morning. Drago also was rather adept at eating socks, intimidating law enforcement officers and driving my ex-wife into a towering rage by stealing freshly made sandwiches. “Been there, done that,” I respond each time some well-meaning acquaintance shows up with a cute wee kitten or a cuddly little puppy. Let’s face facts – cats are notoriously treacherous and puppies grow up to be large mammals with teeth who’ll eventually tree your neighbor and her attorney. Before you know it, you and your dog are both behind bars and your neighbor’s attorney is driving a brand-new Mercedes.Really. “No pets for me, thanks,” has been my oft-repeated mantra for many years, although I have to admit I once had a large can of tuna that I nicknamed “Charlie” and kept on my desk for several years. Charlie had to be “put to sleep” in the company Dumpster after he began to bulge in a rather alarming manner. Then, a few weeks ago while idly thumbing through a colorful toy catalog, I came across the pet that may make my life complete (or at least take up a significant amount of space on my coffee table). 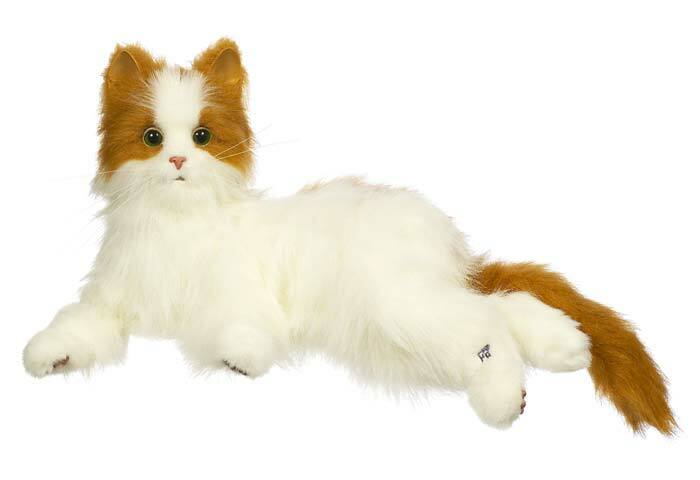 There before my delighted eyes was the “Fur Real Friends Cat,” a lifelike electronic feline with slightly crossed green eyes and a cute little blue grooming brush for only $26.99 (with redeemable discount coupon…). “These pets respond to touch with lifelike movements!” the Toys R Us catalog trumpeted. Most of my co-workers here at the newspaper don’t even respond to touch with lifelike movements, although our research librarian can throw a mean left hook. Even better, this easygoing feline isn’t going to be shredding my flesh every time a perceived slight enters her pointy-eared little head. At last, I’ve found a cat that doesn’t need a litter box – or a dark corner behind the sofa – because the only things this cat’ll leave behind are worn-out C batteries. And there will be no need to locate a cat-sitter the next time I take an extended holiday in, say, Oildale. I’ll just toss my new Fur Real Friend in the closet with a cheerful “Be good!” and hit the highway. Perhaps best of all, if I spill a bowl of corn chowder on my Fur Real Friends Cat, I’ll have that handy little brush with which to clean things up, safe in the knowledge that my little electronic hairball won’t turn me into hamburger during the grooming process. Hey, it doesn’t better than that, amigos.